Pittsburgh East Health Center providers have extensive experience in knee pain treatment. We have pioneered the industry’s latest proven alternatives to surgery and steroids. If you suffer with the Following Knee Conditions; learn more about how Regenerative Cell Therapy can help restore your health and help you live Pain-Free! When the meniscus cartilage raptures due to traumatic injuries or due to age-related wear and tear it is referred to as meniscus tear. Meniscus tear is usually very painful and limiting. The knee will not operate correctly with this type of injury. The meniscus is located at the knee joint. It is a rubbery piece of cartilage that acts as the body’s shock absorber and also acts as a pad to stabilize and protect the knee. Meniscus tear are of three degrees: severe, moderate and minor. Severe meniscus is when bits of ruptured meniscus enter the knee joint and affects the function of the knee causing a lot of pain. But for minor and moderate meniscus tears, the pain usually disappears after conventional treatment or a few weeks of rest. Those suffering from meniscus tear are increasingly becoming aware of the implications of removing the meniscus though surgical operation, they also prefer not to risk the side effects that come with steroid injections. Pittsburgh East Health Center offers a non-invasive alternative to surgery and steroid injections for this problem. We also treat the underlying issues that cause the pain using either Pittsburgh East Health Center’s advanced form of Anmniotic Regenerative Cell Therapy. By using this regenerative approach, the medical collateral ligament can repair itself and regain its function of holding the knee bones in place, thus relieving pressure on other components such as the particular cartilage and meniscus. Degeneration of the joints can occur in any of the joints in the body, especially those that experience lots of wear and tear. The knees are used in so many daily motions, feeling pain with each movement is debilitating. Joint degeneration generally develops over time, but can suddenly worsen and become more severe and disabling. Cartilage or other soft tissues within the knee joint can begin to dehydrate, deteriorate, or become damaged from some type of injury. These tissues provide a protective cushion between the bones for smooth movement. Once these start to wear down, or degenerate, friction within the joint can lead to inflammation, swelling, bone spurs, and other painful symptoms. Recent developments in Amniotic Regenerative Medicine make it possible to treat degenerative joint conditions naturally, without the need for medications, steroids, or surgery. Amniotic Regenerative Cell Therapy uses these cells to target the damaged and deteriorating tissues. Concentrated amounts of these cells are injected into the affected area, and immediately reduce inflammation and reverse damage and deterioration of tissue. The posterior cruciate ligament (PCL) and anterior cruciate ligament (ACL) are both major ligaments providing strength and stability within the knee joint. Ligaments are thick bands of tissue that connect bones. Injuries to these connective tissues are painful, debilitating, and have historically been a challenge to treat and heal. In the past, these kinds of injuries could cause what was considered permanent damage to the knee joints. Traditionally, the most common treatment for torn ligaments in the knee is arthroscopic surgery and reconstruction. Developments in regenerative medicine make effective, natural treatment of PCL and ACL injuries within reach. Procedures like Amniotic Regenerative Cell Therapy offer non-surgical treatment options for those suffering from knee injuries and damage to soft tissues in the joints. Using these cells in concentrated amounts to target the injured area, the body is able to reduce inflammation and heal itself naturally. Since amniotic derived regenerative cell therapy is not derived from embryonic stem cells or fetal tissue, there are no ethical issues with the treatment. The amniotic regenerative cell therapy consists of an injection directly into the painful area. The therapy has the potential to actually alter the course of the condition and not simply mask the pain. This therapy has significant potential for those in pain, and could actually repair structural problems while treating pain and inflammation simultaneously. When the amniotic cell material is obtained, it comes from consenting donors who have undergone elective c-sections. The fluid is processed at an FDA regulated lab, and is checked for a full slate of diseases per FDA guidelines. The amniotic material has been used over 60,000 times in the US with no adverse events reported. It acts as an immunologically privileged material, meaning it has NOT been shown to cause any rejection reaction in the body. This means there is no graft versus host problem. 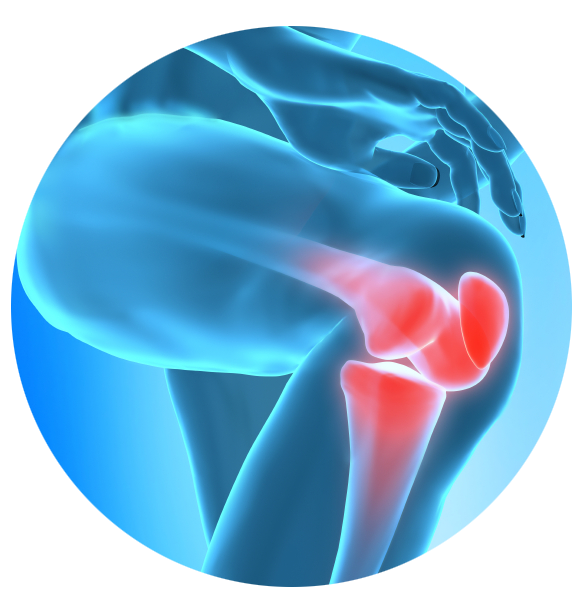 If you’re suffering with Chronic Knee pain, find out if you are a good candidate for Regenerative Cell Therapy. Schedule your free consultation with our specialists today!